A land of over 1,500 lakes, hundreds of islands, vast maple and pine forests and sheer granite cliffs carved by ancient glaciers, the region of Muskoka, about two hours’ drive north of Toronto, Ont., has been attracting visitors from across Southern and Central Ontario for more than a century. Long a destination for palatial country retreats for Canadian captains of industry, Muskoka has also become a favourite second home for many Ontarians, with lakefront cottages passed down through generations of families, who spend long summer weekends playing and relaxing in the region. But in recent times, the word about Muskoka has spread far beyond the province’s borders. 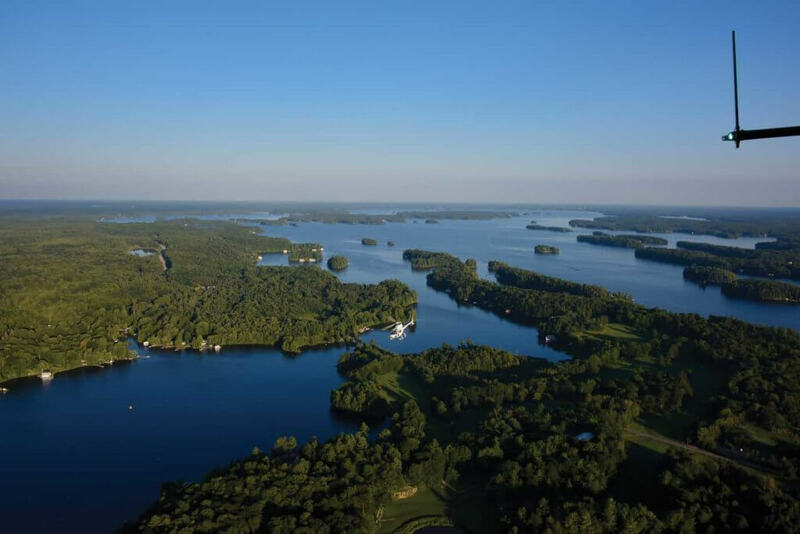 The region’s three major lakes–Lake Muskoka, Lake Rosseau, and Lake Joseph–are now dotted with multimillion-dollar homes belonging not only to the super wealthy from Canada, but also those from south of the border, including many Hollywood celebrities and sports stars. Google “The Muskokas,” and a couple of news headlines give a good impression of how the region is changing. Muskoka becoming Hamptons of the North as cottage prices top $25 million says a Bloomberg News story, while a piece in the New York Times is simply titled, Muskoka: The Malibu of the North. 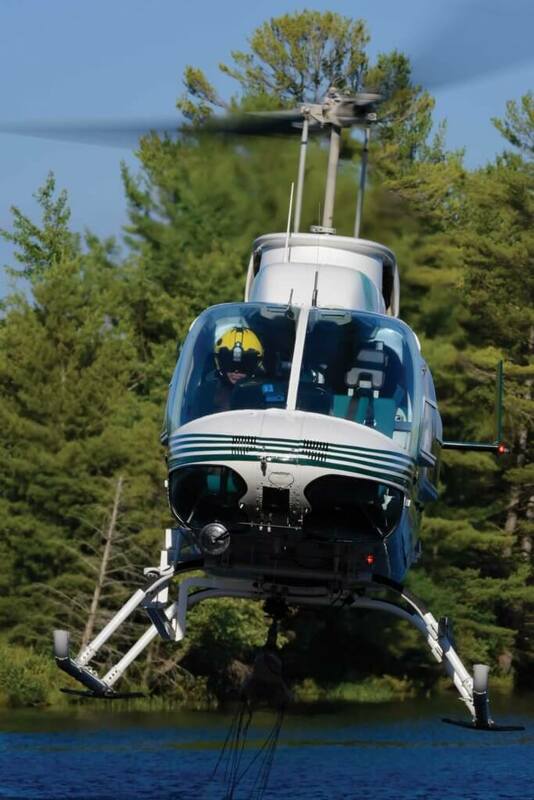 “The population grows by four or five times easily here in the summertime,” Jay McMackin, chief pilot/operations manager of Heli Muskoka, told Skies. 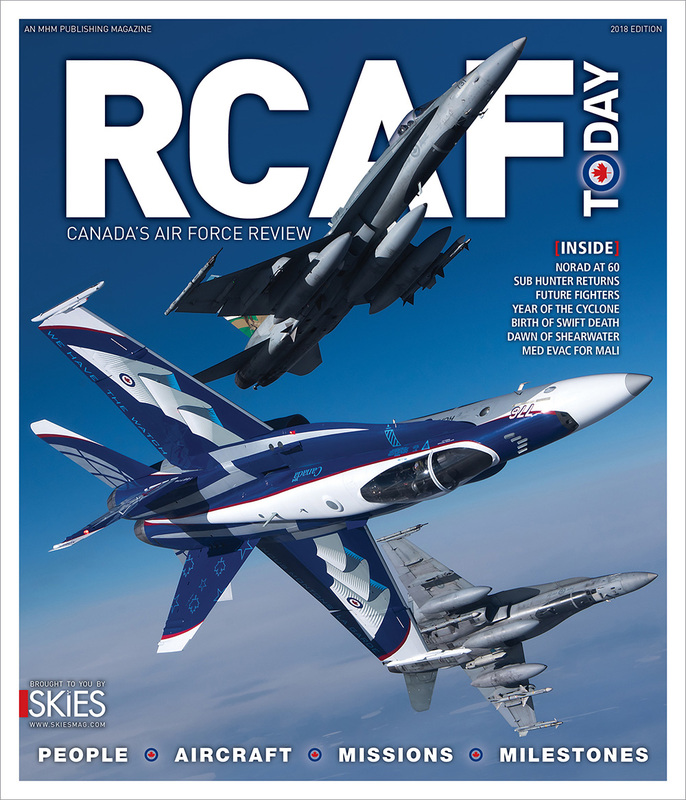 Sitting in his office at the company’s hangar at a very quiet Muskoka Airport on an unseasonably wet and cold midweek day at the end of June, he reflected on the drastic change the airport alone goes through during peak summer weekends. 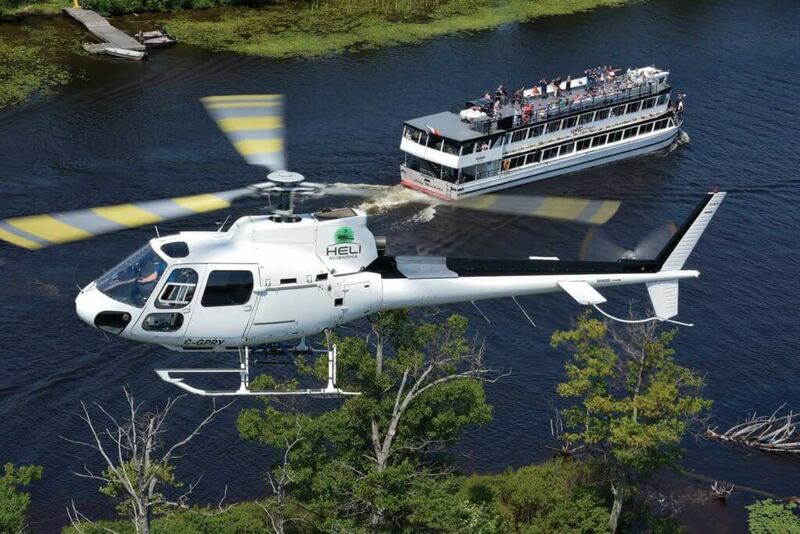 Heli Muskoka is based in the region of Muskoka, about two hours’ drive north of Toronto, Ont. Dotting the shorelines of its many lakes are some truly spectacular country retreats. As a playground for the wealthy and super wealthy, it’s not hard to see why Heli Muskoka’s owners chose the area as the location for their small helicopter company, along with a switch in operational focus from agricultural spraying to utility and tourism work, completed under the watchful guidance of McMackin. The company had previously been based in North Bay, about 150 kilometres further north, but moved south in 2014 soon after McMackin joined the company. A 22-year industry veteran, McMackin grew up in Muskoka before heading north to Sudbury the day after graduating high school to start work on his helicopter licence. 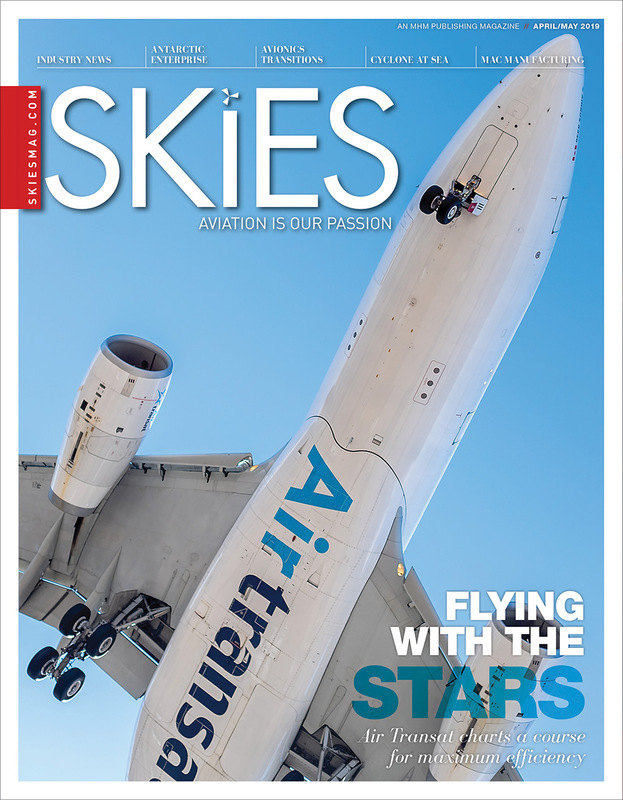 While he was always destined for aviation, he had originally planned to become an airline pilot, but a co-op course during high school with the Ministry of Natural Resources changed his career path. 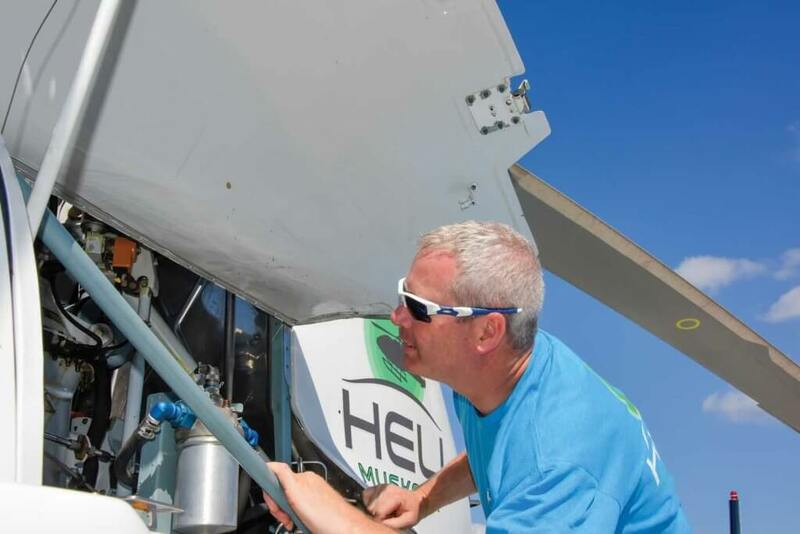 Heli Muskoka’s chief pilot/operations manager Jay McMackin takes a look under the cowling. After completing his training at Heli-North, McMackin stayed with the operator to learn a variety of utility operations on the job in Northern Ontario. His career then took him to Western Canada, back to Northern Ontario, and south to the Greater Toronto Area, building up his experience and gaining his instructor rating along the way. And when the opportunity came to help York Regional Police establish an air support program, he found the challenge too enticing to resist. He served as the pilot for the program–on a contract held by Silverline Helicopters–for three years, before deciding to join the police force as a constable. After three years on the ground, he returned to the air support unit as a tactical flight officer. All the while, he kept up his flying with the occasional freelance job, which also ensured he maintained currency on his ratings. One such job was as the training pilot for Aerial Growth Management (AGM) Helicopters in North Bay–a helicopter spray company established in 2012. AGM’s owners were fixed- and rotary-wing pilots who knew each other from the decades they had spent living in Yellowknife, N.W.T. Heli Muskoka’s Bell 206L-4 LongRanger. McMackin said the aircraft is popular with the Ontario Ministry of Natural Resources and Forestry for use in surveys. Sadly, one partner passed away shortly after AGM began operations, with his wife, Jennifer Roth, and brother-in-law, Mark McDonald, taking his place alongside the other partners in the business. When AGM was looking for a chief pilot in 2014, their positive experience working with McMackin as a training pilot meant his name jumped to the top of their list. McMackin hadn’t considered leaving the police, but when the owners said they would move the company close to McMackin’s home in Muskoka, he felt it was an opportunity he couldn’t pass up. The first year, he worked part time while still with the police to get the operation set up at Muskoka Airport. McMackin said the move has been more than worthwhile. Gord Bain (left), a seasonal pilot with Heli Muskoka, stands alongside McMackin on the flight line. Bain brings huge experience to his role, having flown for more than 30 years with the Ontario Ministry of Natural Resources and Forestry. McMackin’s arrival heralded a slew of changes, with the move to Muskoka, a rebranding and restructuring as Heli Muskoka, and a change in operations. “My background isn’t in spray, and knowing the area of Muskoka, it’s very tourism-based, so I was hoping to go after more of the tourism side of things,” he said. 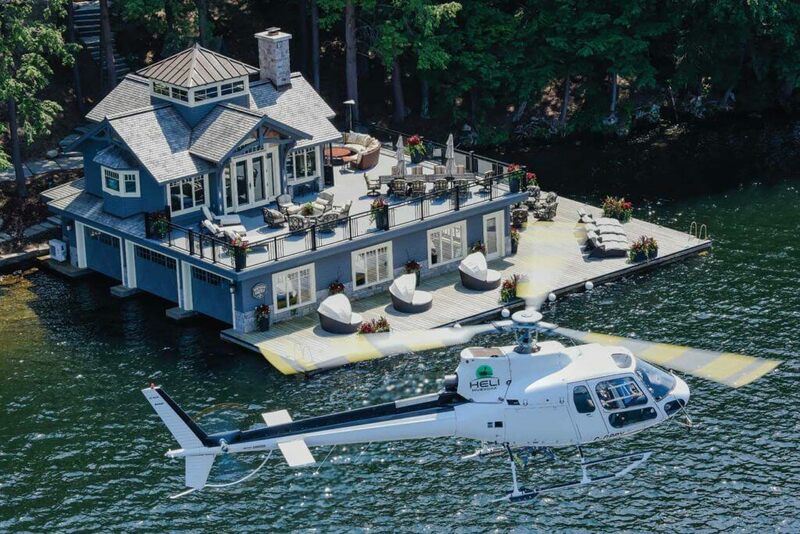 Some cottage owners have even created landing pads at their Muskoka homes to enable them to be flown right to their doorstep. The owners agreed that it was important for the company to diversify. She said there seemed to be a gap in the market in Muskoka, and the perfect person to exploit it in McMackin. 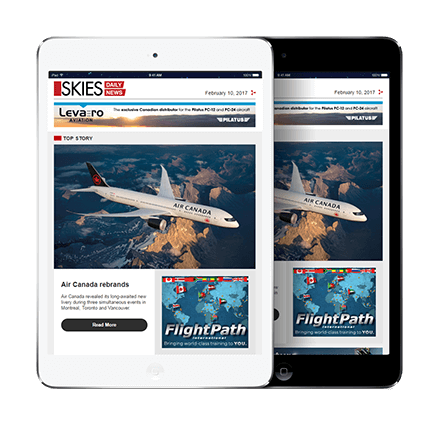 After initially renting hangar and office space at Muskoka airport, the company moved into a purpose-built 4,800-square-foot hangar with office space on a mezzanine overlooking the hangar floor in 2015. The Astar holds a hover with a spectacular boathouse in the background. 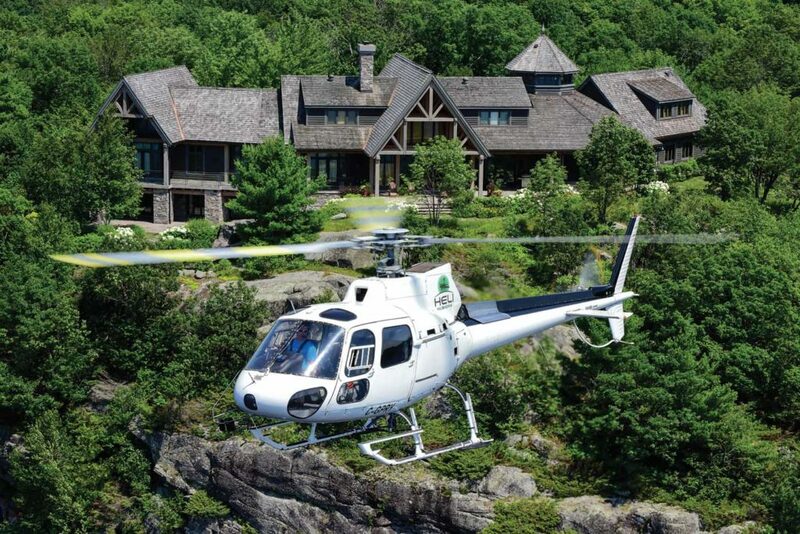 Muskoka is home to some very wealthy individuals, and Heli Muskoka is carving an operational niche in supporting the construction of some of their homes. 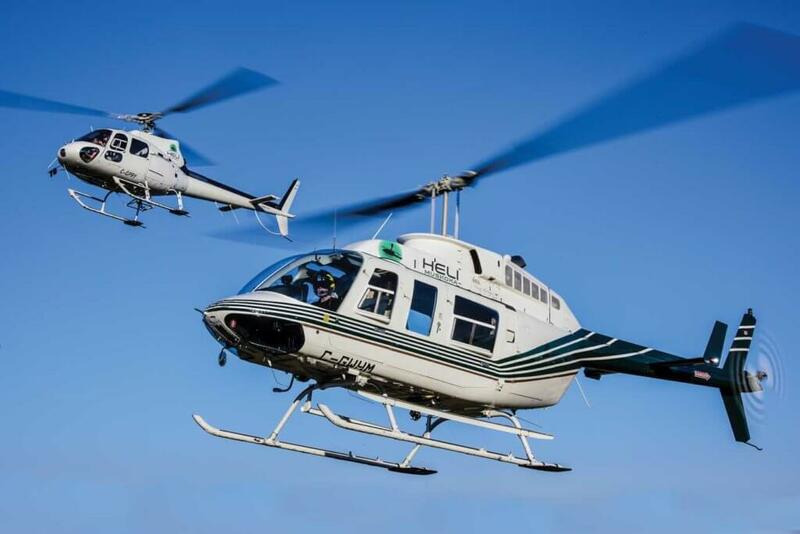 The company’s fleet includes one AS350 AStar, one Bell 206L-4 LongRanger, and one Robinson R44. 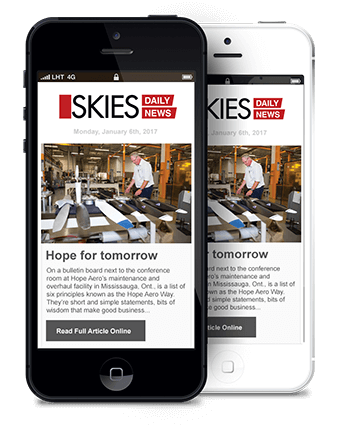 McMackin’s role is all-encompassing, from washing the hangar floor, to advertising the business, scheduling maintenance (completed by Skyline Helicopter Technologies in Sudbury), and working as the company’s only full-time pilot. Two contract pilots join him during busier periods, such as during the summer. 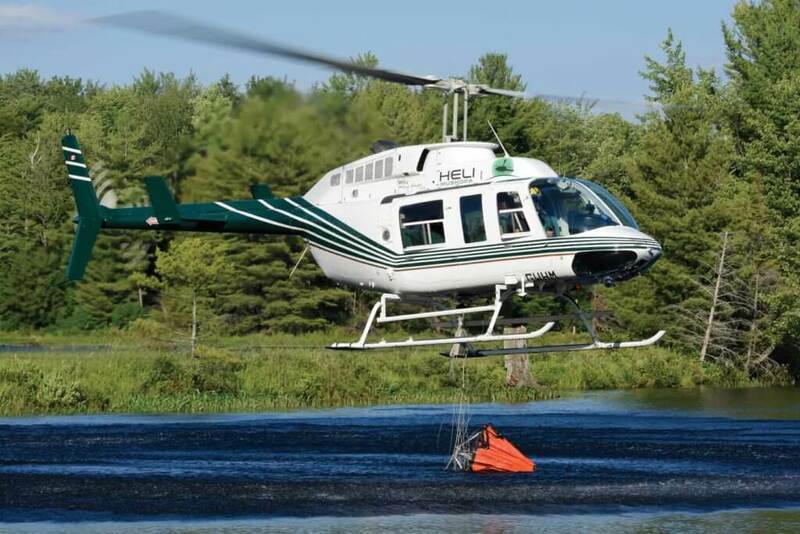 While some of the work completed by Heli Muskoka is familiar to most utility operators (firefighting represented about 60 to 70 per cent of its flying last year), the company has also developed some interesting niches that are fairly unique to its environment. Among these are the transport of “cottagers” from downtown Toronto directly to their property in Muskoka–and back–each weekend, and aerial construction for the multimillion-dollar homes and boathouses cropping up in the region. And with a wet spring resulting in a lack of firefighting work so far in 2017, the growth in these other markets–largely through word of mouth–is proving crucial. The AStar and LongRanger are joined in the Heli Muskoka fleet by one Robinson R44, but the larger aircraft perform the bulk of the work. McMackin said he can move about 10,000 pounds of construction material an hour with the AStar, reducing the number of man-hours spent on site, and making the cost if not less overall, at least comparable. Moving expensive material for high-end homes is not without its stresses, but McMackin’s origins in long line work in Northern Ontario mean he is well qualified for such precision work. “I did a pre-fab log cottage last week, where all the walls came in sections that were already built,” he said. “They were standing them up vertically as I was coming in, so each time as I came back with another load, I had less and less space to work with as the walls were going up. With over 1,500 lakes in the region, there are many opportunities for prospective cottage owners to secure lakefront space for their property. The number of shuttle runs to Toronto is also growing, saving weary commuters not only a good deal of time, but also the stress of navigating through the clogged arteries of the highways leading in and out of the city on summer weekends. 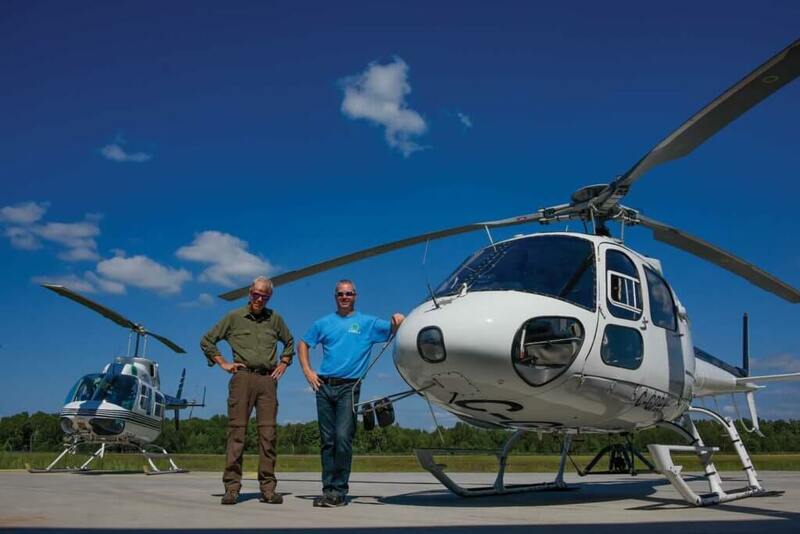 Last year, 60 to 70 per cent of Heli Muskoka’s workload was in aerial firefighting, but this year, it has had to pursue other opportunities. 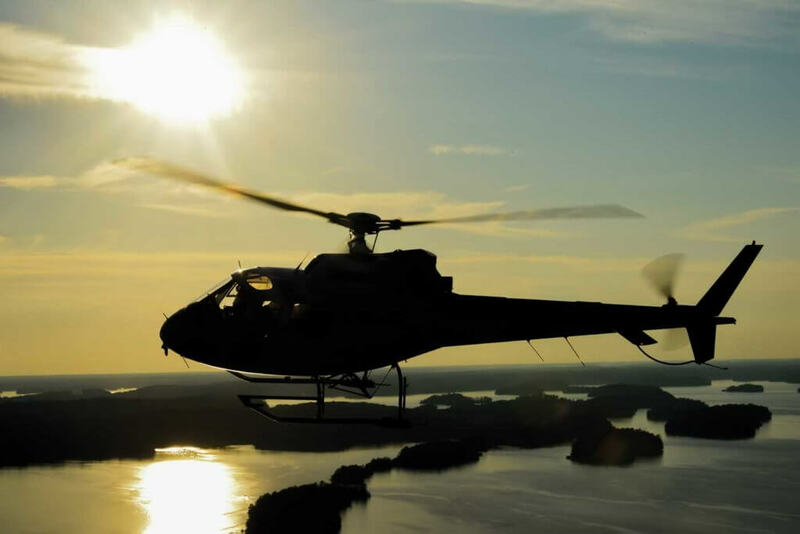 As well as these custom charter operations, Heli Muskoka caters to the more general tourism market, offering sightseeing flights from the airport or resorts out over the region, or over nearby Algonquin Provincial Park. 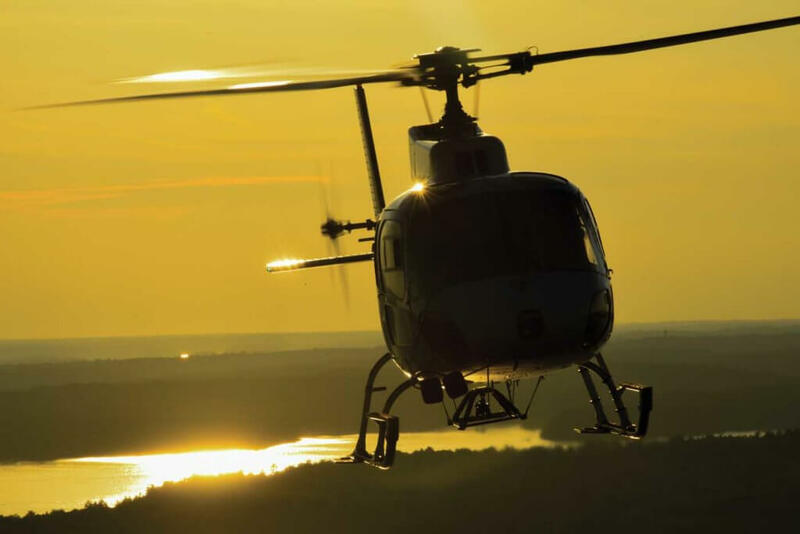 Launching a helicopter company in the current environment hasn’t been easy, but Heli Muskoka’s operational diversity means it is well placed for the eventual industry upturn. Fall is also a popular time for helicopter tours, with visitors wanting to take in the beautiful fall colours. In terms of future development, McMackin said he hoped to secure some exploration work as that market rebounds, and hasn’t ruled out the possibility of offering training. For now, the company’s streamlined structure has allowed it the maximum flexibility as it negotiates the challenges of being a new company in an industry that’s enduring a general downturn.